DeFuniak Springs, FL…Former President Jimmy Carter will be the featured keynote speaker at the first Plains Chautauqua weekend event themed “A Journey to Plains,” May 2-4, 2014. Planning by the Plains Historic Preservation Trust for the weekend Chautauqua, which since 2008 had been a multi-evening event, is inspired by former First Lady Rosalynn Carter’s visit to DeFuniak Springs as featured keynote speaker at the 2013 Florida Chautauqua Assembly in DeFuniak Springs. President Carter will speak at the lectern which Florida Chautauqua President Christopher Mitchell presented to Mrs. Carter in DeFuniak Springs during her historic visit to Walton County, and Florida Chautauqua Center board member and historian Robert Daniel will present historic documents and information to the Plains delegation to assist in their research development. Mitchell is a past aide to former President and Mrs. Carter at The Carter Center in Atlanta and traveled with the Carters to developing countries throughout central Africa as the Carters worked to eradicate disease, to help poor farmers grow their food more efficiently, and to stop civil wars. 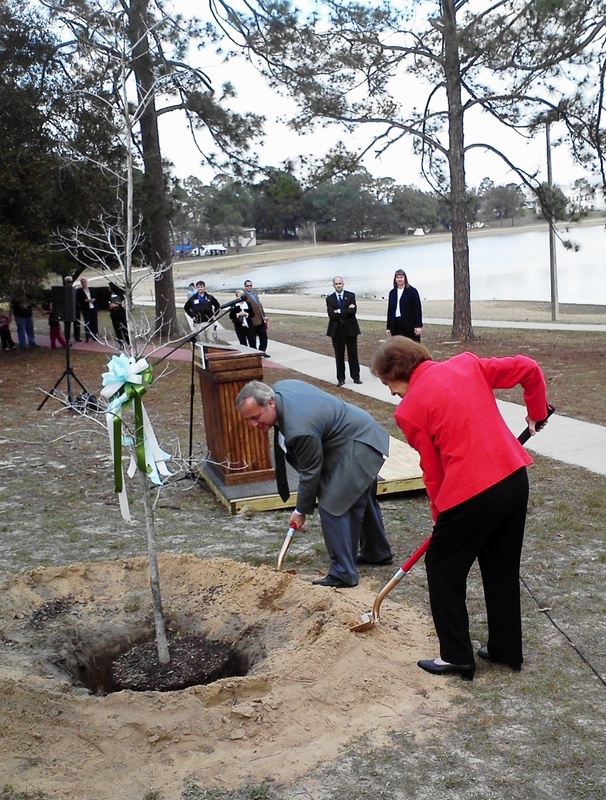 Since leaving The Carter Center and moving to Florida, Mitchell has remained in contact with the Carters, particularly on his work with leading the Florida Chautauqua Assembly since 2008 in DeFuniak Springs. In September 2011, Mitchell attended the Plains Peanut Festival where Mrs. Carter was signing books she authored on mental health and care giving, and he encouraged her to consider starting a Chautauqua in Plains to discuss in depth these and other issues of concern to her. The suggestion lead to a one-hour call to Mitchell by representatives of the Plains Historic Preservation Trust comprised of community leaders interested in preserving and promoting the history of Plains, Georgia. Following Mrs. Carter’s 2013 Florida Chautauqua presentation, Mitchell gave her a lectern he commissioned by construction technology students of the Walton Career Development Center in DeFuniak Springs which is a replica of the one she and President Carter used in Plains, Georgia the night they won their bid for the White House. Six weeks after Mrs. Carter’s presentation, the students delivered the lectern to Plains which the Carters and the National Park Service used for the rededication of the Plains Depot. At the rededication ceremony, Annette Wise, leaders of the Trust and the Plains Chautauqua remarked how the Carters and Plains Historical Preservation Trust will be using the lectern for the Plains Chautauqua in May and how grateful they are for the gift from the Florida Chautauqua president and delegation. Mitchell has called a special meeting between the Florida Chautauqua Center delegation and the Plains delegation on May 1, the day before the Plains Chautauqua begins, to discuss and share several hundred pages of information about the original Chautauquas in nearby Americus, Georgia during the early 1900s. Robert Daniel, Florida Chautauqua Center historian, spent countless hours tracking down the information and communicating with scholars from University of Iowa Libraries about the Redpath Chautauqua Collection, which is pertinent to the original Plains Chautauqua, and has received copies to present to the Plains Historic Preservation Trust at the May 1 meeting. The Plains Chautauqua is scheduled for May 2-4, 2014 in Plains, Georgia. Full weekend passports are already sold out. However, there are some individual session tickets available as well as some tickets for the Saturday keynote speech and book signing by President Carter. Individual tickets are available and must be purchased in advance. There are a number of free events on Saturday from 9:00 a.m. – 4:30 p.m. including a small antique car show, Plein Air Paint Show, Old Farm Days at the Jimmy Carter Boyhood Farm and a May Day Celebration at St. Mark Church. For registration information, visit www.PlainsChautauqua.com or call 229-824-4567 or email Annette Wise at plainsed@gmail.com. This entry was posted on April 19, 2014 by 850music in Posts and tagged press release.